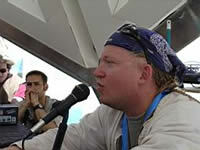 A talk by Jon Hanna at Burning Man 2003. Posted in Burning Man, Consciousness, Creativity, Culture, Jon Hanna, Palenque Norte, Psychedelics and tagged Burning Man, Consciousness, Creativity, Culture, Jon Hanna, Palenque Norte, Psychedelics. Just a quick observation: The talk was focused on the question of how much literal truth can be divined from psychedelic experiences. In the case of, say, Jon’s apparent OBE, this question looms quite large: Either he was recognizing stuff he’d previously seen from above, or not. But it’s also true that you can “bring back” a great deal of metaphorical truth as well. In the case of the insect-like creatures that were feeding on negative thoughts, for example … well, that’s a ready-made metaphor for life–the more we ‘feed the wolves’ with our negative thoughts and intentions, the stronger and scarier they become. Can we starve them out by shifting toward more uplifting internal dialog and mind states? It seems that many types of visionary experiences can be interpreted metaphorically to good effect, along the lines of Joseph Campbell, regardless of the literal truth involved. When people literalize certain things in ways that seem to be destabilizing to their normal lives, one way to work with them might be to encourage them to loosen up around the literal interpretations and to look for relevant metaphors.